The amount of concrete that covers and protects the rebar or reinforcing steel in reinforced concrete. It is th e least distance from the outside face of the concrete to the closest steel reinforcement. 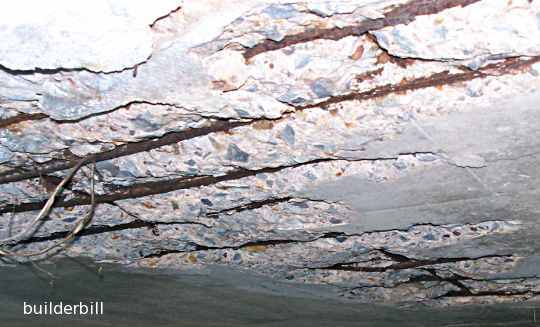 A failure of reinforced concrete where moisture has penetrated the concrete to the extent that the reinforcing steel is rusting. A cycle of rust expansion, crack creation and further rusting is set up. In the detailing of any reinforced concrete job the structural engineer will state (or refer to published standards) the amount of cover that he requires for the rebar. An adequate amount of cover is required for a number of reasons. To protect the steel from the effects of moisture. This may be ground water in the case of a slab on the ground or air borne as was the case in the suspended slab in the photo above. Fire protection. Adequate cover protects the steel from thermal expansion and collapse in case of fire. To give the rebar enough embedment in the concrete to prevent slipage. The amount of cover varies from job to job, here are a few generalisations. Concrete with less quality control like site mixed or hand mixed, or concrete with higher water cement ratios should have increased cover. Concrete subjected to harsh environments like chemical or salt water attack should have increased cover. The three main causes of this problem are poor concrete, poor concrete and poor concrete. Closely followed by not enough concrete cover. Poor concrete can have any number of causes and any combination of a few of them. Harsh environment. The jobs that stick out in my mind in connection to this are coastal properties and salt spray. Pumping stations where chlorine is added. Even domestic swimming pools with their salt water or chlorine. Not enough vibration leaving "rat holes" in the concrete. It can simply be using the wrong materials. (I replaced twenty odd concrete columns once that had been made using beach sand). Poor job practises. Not cleaning out the bottoms of forms and so leaving scraps of tie wire, nails and sawdust embedded in the concrete. Not using bar chairs at all or not having enough of them to hold the rebar in position under the loads of men and material during the concrete pour.